An interest form for health-related research training opportunities at CSULB with the MARC, BUILD, and RISE programs. You will be contacted with upcoming events like training program information sessions, application workshops, and application due dates. 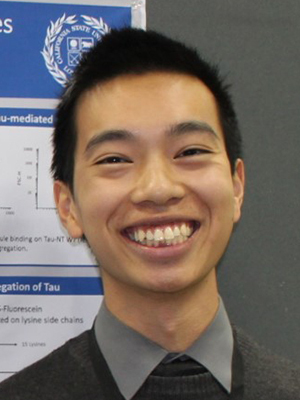 Congratulations to Jordan Ngo, a MARC scholar and senior chemistry student working in Dr. Bhandari's lab, for winning first place at the American Society of Cell Biology and European Molecular Biology Organization (ASCB | EMBO) conference in San Diego on December 8-12, 2018. Jordan's undergraduate poster, titled "Identification and Characterization of a Novel Phosphoregulatory Site on Cyclin-Dependent Kinase 5," competed against ~160 other students and received a perfect score from both judges. The Maximizing Access to Research Careers (MARC) Undergraduate Student Training in Academic Research (U*STAR) training program offers an excellent opportunity for undergraduate students seeking careers in biomedical research. We aim to increase diversity in biomedical research by identifying students interested in pursuing research as a career at an early stage and by providing training opportunities. Students from a variety of backgrounds are encouraged to apply especially those traditionally underrepresented in biomedical research (for example, racial and ethnic minorities, students from a socioeconomically disadvantaged background, students with disabilities). The MARC Program is funded by the National Institute of General Medical Sciences (NIGMS), National Institutes of Health (NIH) (T34 GM008074).